Katherine McConnell is CEO and Founder of Brighte. 3 years ago, Katherine was in a comfortable corporate job. Today she is Fintech Leader of the year, running a successful, rapidly scaling business and has the backing of Mike Cannon-Brookes. Dexter Cousins has been recruiting leadership talent for 20 years and no one has impressed him as much as Katherine. She is rightly hailed as an inspiration to female entrepreneurs. But her courage, commitment, vision and focus serves as an inspiration to everyone. From corporate career to FinTech leader of the year. The amazing story of Katherine McConnell. What motivated you to start Brighte? 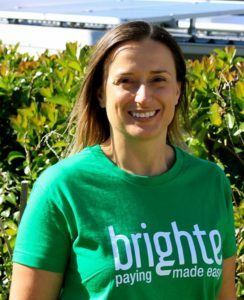 Katherine: The idea for Brighte came in 2015, it was a combination of two things; deep industry experience (Katherine spent 14 years at Macquarie Bank in asset and energy finance.) And identifying an opportunity in the market to provide a faster, easier way to finance solar panels and batteries, especially for families around Australia. My family had installed solar and it was an exciting time. There were days where we lived totally off the grid. Some days we were putting energy back into the grid, even making money from our solar set up. Our two kids were fascinated. However, having solar installed was expensive. I knew that as the cost of batteries came down, solar would become more accessible for Australian families. Even today, solar is still expensive to install so finance is often needed. You pay for solar panels, batteries and the installation upfront, but over time you generate savings on your energy bill. A payment plan product where you can pay over time wasn’t on the market when I installed solar. And that is how Brighte was born. It was a mixture of personal excitement, and the realisation of a potentially huge market opportunity. How did you get started on Brighte? Katherine: I began working on Brighte over a period of a few months. Resigning felt like a much bigger deal than starting the business. Now I have had success, a lot of people come to me with great ideas, but they can’t bring themselves to quit their regular job. I understand why they find it so difficult. Macquarie was a big part of my life, for 14 years. How do you give it all up for what feels like a crazy dream? The only person who can get you to make the leap is you, but for someone in a corporate role, who’s rational, that’s a really, irrational step to make. What is it like to go from having a stable job to becoming a business leader and CEO of one of Australia’s fastest growing FinTech’s? Katherine: Every day has offered a different experience. A lot of what I am doing hasn’t been done before. A sole female founder, in the finance industry, starting a lending business, mum to two kids. At Macquarie I never had a team. Until Brighte I had never managed anyone in a business, no leadership training. Source: From corporate career to FinTech leader of the year. The amazing story of Katherine McConnell.